Struga is situated on the northern part of the Lake Ohrid, on the both banks of river Crni Drim. Struga is located on 171 km from the capital Skopje and from the nearby city Ohrid, is just 15 km away, while from Debar is 52 km away. It is believed that in the ancient times, there was a little town here called Etelion. Struga was founded during the middle ages. Struga is the capital of poetry and one of the cradles of the Macedonian spiritual revival in the 19th century, for it is the birthplace of the outstanding poets and educators, the brothers Dimitar and Konstatin Miladinov. Here, one is charmed by the source of the river Crni Drim, which flows into Lake Ohrid and runs across it, only to emerge again with its clear and greenish water, and beautify the already delightful town of Struga. 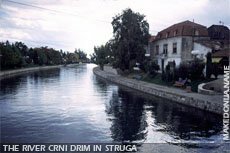 Struga is a famous tourist resort, and it is an eternal inspiration for poets from all over the world. Since 1962, each year at the second half of August, the Struga Poetry Evenings held in honor of brothers Miladinovci, have gathered poets from all the continents. The Struga Poetry Festival is one of the oldest, largest, and most renowned of its kind in the world. At the spectacular poetic event entitled "Bridges", poets read their works from the bridge under which the River Crni Drim flows out of Lake Ohrid, before an audience of some ten thousand people. Some of the greatest poets of the world are recipients of the Golden Wreath, the highest accolade of the festival. There are several cultural monuments in Struga and in its vicinity such as the Monastery of Kalista, a few kilometers away from the town center, laying on the very shores of Lake Ohrid, in Kalista. It is believed that it dates from the 15th century, with frescos from the 15th and the 16th centuries. The Church Sveta Bogorodica (Holy Virgin) in the village of Vranista, is believed to be the one where Tzar Samoil was crowned. The church has many doors and the people call it also "the kings church". Another church St. George in the town, build on the foundations of the Samoil's church, has many icons from the 14th, 15th, and 16th century. Near the village of Radolista, a basilica from the 4th century has been discovered, with an extraordinary beautiful mosaic. In the cultural-historical monuments of Struga, can also be included its old architecture from the 18th and 19th century. The historical town of Ohrid, only 15 kilometers from Struga, is also situated on the shores of beautiful Lake Ohrid. Near Struga is located the village of Radožda, where is a part of the ancient Roman main road Via Egnatia. It is located 300 meters western of the village on mountain Jablanica, near the border crossing point Kjafasan. The road is made of well decorated blocks with dimensions 2.5x3 meters. The road is well kept and has a trace of 100 meters with 5 stops (31-4-19-19-21) and then gets lost in the vegetation. Located near Vevčani in the mountainous village of Oktisi is an ancient Christian basilica from the end of 5th or the beginning of 6th century. The mosaic floor of the church is richly decorated with representations of deer, horses, flowers, trees, and geometrical ornamentation. The village of Gorna Belica (1,600 meters above the sea level) can be reached by driving, biking or walking from Struga, or by hiking from Vevčani. Nowadays, only two elderly ladies live all year round in the village, although other residents visit on weekends and holidays. The church of St. Petka is undergoing restoration, but the two ladies are happy to tell its story and that of the saint. The owners of some of the cottages offer accommodation in their homes, and there is a modern hotel in the centre of the village. The legends says that St. Clement used to rest here in the past.